EFCC raids the Sun newspaper office – Royal Times of Nigeria. 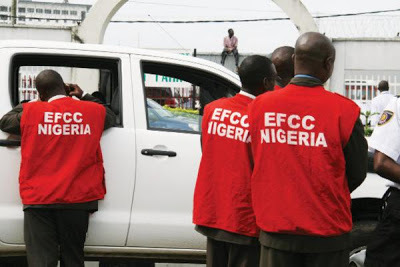 The Economic and Financial Crimes Commission (EFCC) on Monday raided the office of the publishers of The Sun Newspapers. The media organisation is owned by former governor of Abia State, Dr. Orji Uzor Kalu who has a case in court with the EFCC. The newspaper in a statement said the operatives claimed that the raid was an order from above. The statement said; “Law-abiding staff of The Sun Publishing Limited resumed work this morning, June 12, 2017, to behold heavily armed EFCC operatives in our company. They claimed to have “orders from above” to seal up the premises of The Sun Publishing Limited. “At gunpoint, they ordered our security personnel to take them around the company premises, after which they proceeded to prevent staff from either entering or leaving the premises, and disrupted our circulation process. “For one gruelling hour, the EFCC operatives subjected our staff to crude intimidation, psychological and emotional trauma, even as some of the men accused our organisation of publishing pro-Biafra, Boko Haram, and Niger Delta militant stories, as they surveyed our premises. “We recall that in 2007, (10 years ago) the EFCC had obtained an interim forfeiture order in respect of some assets of The Sun, attached to a suit against our Publisher, Dr. Orji Uzor Kalu, for which we have filed an appeal, which is still pending in court. “We also recall that the Acting Chairman of the EFCC, Mr. Ibrahim Magu, had written a letter personally signed by him dated 23rd of May and received on the 7th of June, asking The Sun management to report to the Commission on 5th of June, detailing our operations in the last 10 years, on account of an interim order of forfeiture under appeal. “As a law-abiding corporate citizen, our lawyer, Chief Chris Uche SAN, wrote the Commission to intimate the Agency that the issue was pending before the Court of Appeal. The receipt of our correspondence was duly acknowledged.”We were therefore shocked that our premises would be invaded by the Commission under whatever guise. This is condemnable and reprehensible. No one, Agency or authority should be above the laws of our country. An abuse of the law is a recipe for chaos. “Magu had in an earlier letter threatened to sue The Sun over a report published by one of our titles, pertaining to a report on investigation of a property allegedly traced to his wife. But up till now, we are yet to receive any court process. “In the light of the above, we strongly view this onslaught against The Sun as a personal vendetta by the leadership of the Commission, and by extension a declaration of war against the media. “In this invasion of our premises, it is crystal clear that what Magu and his Commission are after is not only to intimidate and muzzle us, but a furious attempt to call a dog a bad name in order to hang it. “On the issue of the interim order, which he purportedly based his invasion, Magu knows the matter has been on appeal since 2007 for which hearing comes up this week. But rather than wait for the court process, thecCommission under the leadership of Magu, typically resorted to self-help. “We want the general public to take note of this authoritarianism and high-handedness, which has been the hallmark of Magu’s leadership of the EFCC. “The other charge of publishing Biafra, Boko Haram, and Niger Delta militant stories is very ridiculous, baseless and anti-Press freedom. “We like to state that we are neither an ethnic, political nor religious newspaper, but we are the Voice of the Nation, reflecting all sides, all views and all shades of opinion in line with the ethics of our profession. “We challenge Magu and his Commission to show where The Sun’s stories have been different from other papers in the country.